BBI Development S.A, an official partner of the stand of the Capital City of Warsaw during the MIPIM 2018 in Cannes, is the only investor in Warsaw that will present three projects located around Plac Defilad during the largest European real estate fairs starting on March 13th. 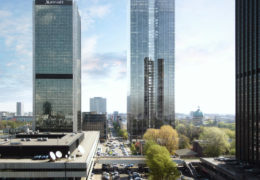 The skyscrapers of ZŁOTA 44 and Roma Tower as well as the office and commercial building of Centrum Marszałkowska open new possibilities for the development of Śródmieście downtown and the entire capital. The offer of BBI Development S.A. and its partners is complemented by the multi-purpose Centrum Praskie Koneser – the largest revitalization project carried out in Praga Północ district will be put into operation this year. “Warsaw is triumphing again. It has been at the forefront of the European business-friendly cities, ranking third in the latest fDi Financial Times’ ‘Cities of the future 2018/2019’ table. It is a metropolis that attracts global investors not only because of the excellent economic indicators or access to qualified staff. While competing for the attention of global companies, Warsaw stands out because it understands how crucial the high quality of life in the city is, also maintaining its identity and building a rich cultural offer. Warsaw deserves top class properties that can ensure a truly dynamic development, add splendour and, at the same time, can refer to its traditions and are implemented in a sustainable and open manner. With such projects we will be present this year at the MIPIM, promoting jointly with the city office the capital – among 5,600 other investors from over 100 countries with around 25,000 visitors” – says Rafał Szczepański, Vice CEO of the Management Board at BBI Development S.A.
Centrum Marszałkowska, an office and commercial building, implemented in cooperation with the Warsaw housing cooperative “Spółdzielnia Spożywców Społem Śródmieście”, gives its investors the opportunity to use the very potential of Warsaw’s Śródmieście downtown. It is the first project of its kind to be created at the crossing of two main arteries – Marszałkowska and Świętokrzyska streets and at the intersection of two metro lines, which will offer its users a view of the prospective Museum of Modern Art – an investment that will change the face of Plac Defilad. Centrum Marszałkowska is part of a trend to create attractive spaces – the building has been designed to boast green terraces with a total area of almost 1,000 sq m, which will be filled with flower meadows and rest areas. The investors will also revitalize the pedestrian passage of Witold Rowicki, where residents will be able to relax while being surrounded by greenery and small architecture. As part of the investment, the iconic Sezam store will return to its original location. In addition, memorial plaques will be unveiled on the building’s facade, commemorating the past of the place: a plaque dedicated to the heroic death of the Warsaw Insurgents as well as a plaque dedicated to Witold Rowicki – the long-time artistic director of the National Philharmony. Złota 44, implemented jointly with the Amstar fund, is a project that sets a new standard for luxurious living – thus reflecting the aspirations and successes of Poles. The 192-metre building, designed by the world-famous architect Daniel Libeskind, is the highest, exclusively residential tower building in the European Union, offering access to one of its kind (1,800 sq m) recreational floor with a swimming pool, fitness zone and a golf simulator. The project is in dialogue with the iconic Palace of Culture and Science and it has forever changed the panorama of Warsaw, becoming a new icon of the capital. In February, the investors put on sale a pearl of luxury – the highest-located penthouse in the European Union, with a bedroom located almost 200 metres above the ground. This is a 600-sq-m, three-storey apartment, which is located on the 52nd, 53rd and 54th floors of Złota 44 – its advantage are not only the unique views, but also a private, more than 30-sq-m terrace. 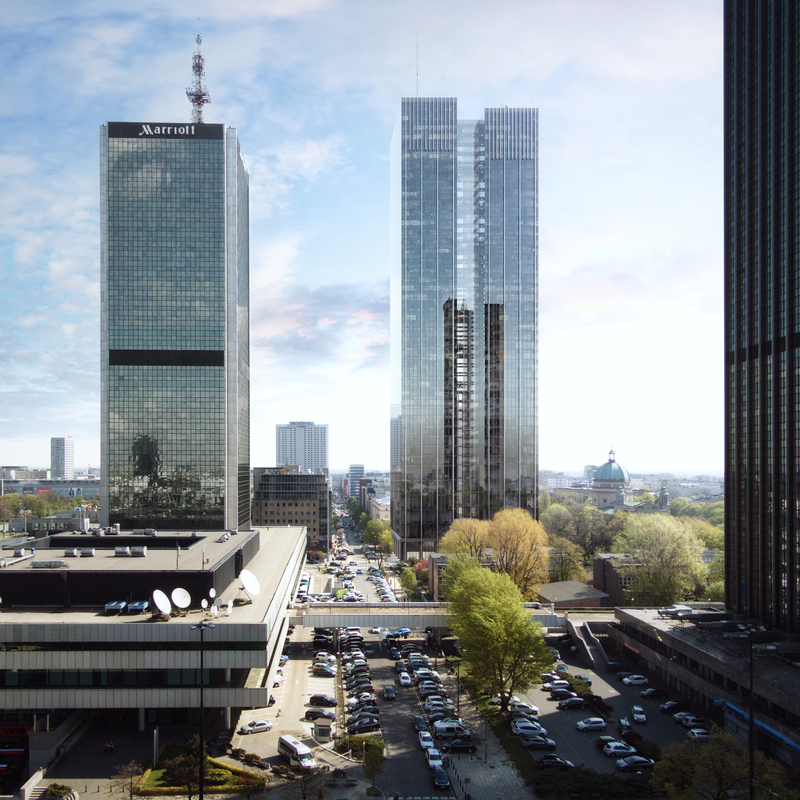 The latest project of BBI Development – the Roma Tower skyscraper, planned at the intersection of E. Plater and Nowogrodzka streets, is continuing the tradition of erecting high-rise buildings in this part of the centre of Warsaw that actually began in 1972. It will open the capital to people seeking the highest standards of living in the area of business and tourism. The project will house the headquarters of a six-star hotel run by a leading global hotel company. The investment will give an impulse for the development of Śródmieście downtown, especially cafes, restaurants, boutiques and service outlets in its wider surroundings. The Roma Tower project opens a new era of high-rise buildings implemented in accordance with the philosophy of sustainable transport. Bearing in mind environmental issues, such buildings should be built in well-communicated city centres with dozens of public transport lines available, and not in the suburbs. Such an urban planning policy contributes to reducing the amount of smog in the city. Centrum Praskie Koneser, located near the Dworzec Wileński metro station, is a multi-functional project that is created in cooperation with Liebrecht & wooD in the former Warszawska Wytwórnia Wódek “Koneser” distillery and contributes to the revitalization of this part of Warsaw. In total, almost 350 apartments will be built (lofts and soft lofts) within the area of 5 ha – half the size of Warsaw’s Old Town, in addition to 28 thousand square metres of retail space and further 22 thousand square metres of office space. The investment will very soon see the opening of the-first-in-the-world Museum of Polish Vodka. Thanks to much of the investor’s efforts, an attractive open public space – Koneser Square – will also be built here. “Part of the office building of Centrum Marszałkowska, at the time of commissioning mid-year, will be commercialized in its entirety. This year, we are also opening Centrum Praskie Koneser, where the office space rental has exceeded 90%, whereas the sales level in the third residential building, Skarbnica, is higher than 75% six months before the opening. This year, we are also anticipating the finalization of a record number of contracts with individual clients for Złota 44. The interest in luxury apartments is increasing, and in February we concluded a record transaction with one client who purchased a 240-metre apartment on one of the highest floors of the skyscraper. We are now preparing to implement the Roma Tower investment. At the beginning of February, the local spatial development plan for the southern city centre became valid, and we expect a construction permit in place by 2020. This is when we would like to start the construction work”– sums up Rafał Szczepański, Vice CEO of the Management Board of BBI Development S.A.